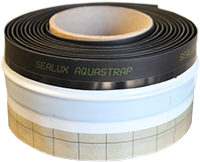 The Sealux shower seal design offers many performance advantages over traditional soft-lip sealing strips. Installing the Sealux Sealing System before tanking shower walls over shower trays and baths offers the following advantages. (1) Tanking across ledge/wall gaps. The question often arises of how to bridge the gap between a wall and adjacent ledge. Many tanking membranes are limited in their capacity to bridge joints more than a few millimetres. 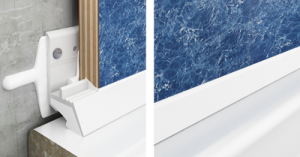 Sealux profiles can bridge wall/ledge gaps up to 12mm. The tanking membrane simply overlaps the Sealux strip up-stand. This ledge/wall joint bridging facility provided by the Sealux profile also eliminates the problem that a tanking membrane bonded to the ledge might extend out in front of the exposed face of a tile. In the scenario where a wall membrane must extend out over the rolled edge of a bath, it is unlikely a 4mm tile bedded on 3mm adhesive will provide full coverage over the membrane below. (2) Ease and speed of waterproofing. Ease of installation is important for diyers and speed of installation is an issue for some installers. It is not just easier to bond the waterproof membrane onto the Sealux strip up-stand than onto a ledge, but it is a much quicker and a more precise method in the confines of 3 sided shower enclosure. The Sealux sealing system incorporates the use of a patented pvc profile with a high performance Sealux-N silicone. 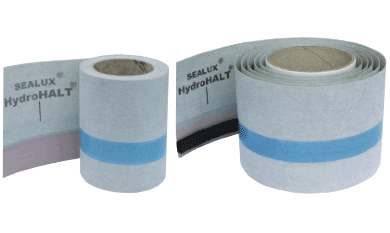 Sealux profiles have their inside face strategically layered with a silicone bond-breaker that after installation allows the Sealux-N ‘ledge/wall bridge’ to release off the inside face of the profile under tension and freely stretch to accommodate ledge/wall joint expansion. There is no stress whatsoever created in the waterproof membrane. The Sealux sealing system hides the entire Sealux-N ‘ledge/wall bridge’ inside the pvc profile. 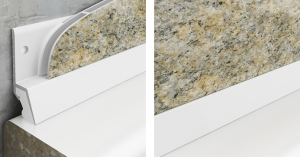 The Sealux-N silicone is not directly exposed to the shower environment, it remains concealed from view and environmentally protected between the profile and ledge. Sealux seals are maintenance free and the issue of unsightly mould does not arise.